"I Admire Him"...Jeong Jaeil X Park HyoShin Combination Admired by IU, How are They? 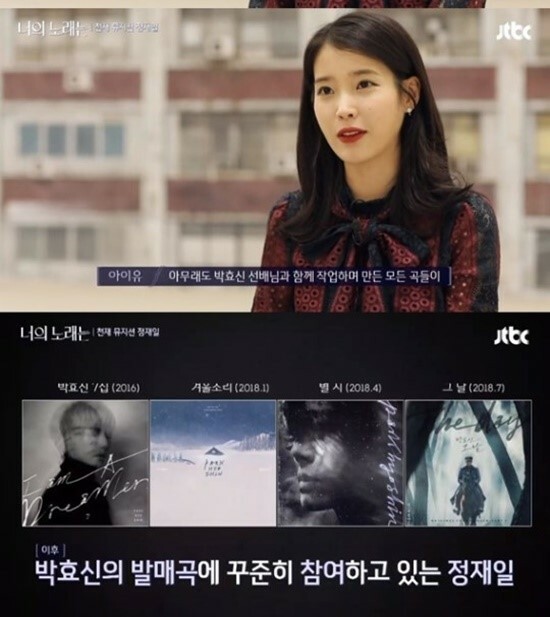 [THE FACT] The singer IU has expressed that she admires the result of the singer Park HyoShin and the composer Jeong Jaeil at the program ‘Your Song’. On the 17th afternoon, JTBC ‘Your Song’ presented Jeong Jaeil and Park HyoShin working on their music in a rural village in France. Before their story started, IU appeared talking about Jeong Jaeil. IU has expressed “During the release of my remake album ‘Kkot-Galpi #2’ in 2017, I requested him for rearrangement of my song and his arrangement was done so beautifully. I really admire him normally but now I like him even more after the arrangement”. With the question of “What’s your favorite music of Jeong Jaeil?”, she answered, “I think all of his songs worked with Park HyoShin are always perfect”. Jeong Jaeil and Park HyoShin has presented musical results together such as ‘Wild Flower’ released in 2014 as start, ‘Park Hyo Shin 7th Album’(2016), ‘HOME’(2016), ‘Sound of Winter’(2018), ‘The Other Day’(2018), ‘The Day’(2018). Meanwhile, during the program on this day, Jeong Jail and Park HyoShin were working together on the 8th album of Park Hyo Shin.